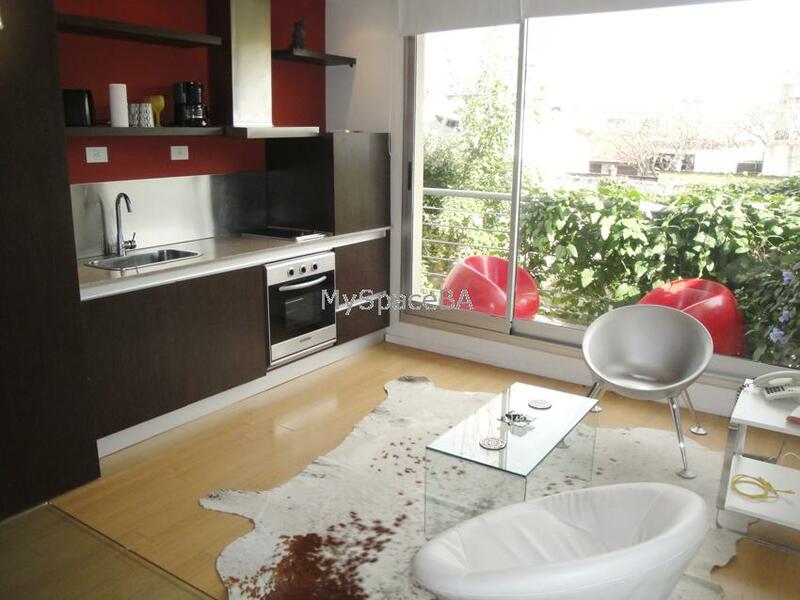 Lovely and bright one room apartment located in a very resitencial area: Palermo Hollywood , calm and safe. The Studio is situated at the back of the building, it has a lovely balcony. It offers a living area with two comfortable chairs, an open plan kitchen , a dinning area with a glass table and chairs. Internet High Speed by cable, Aircon ( hot / cold ). In the bedroom area there is a double bed , LCD TV , a complete bathroom with bath tub and shower. A very good option to stay in a very calm area. Balcony . Hardwood floor . Internet High Speed by cable . Landline telephone for local calls . Cable TV. LCD TV . Fully equipped kitchen with refrigerator , microwave , stove , oven , coffe-machine . Toaster . Dishes . Towels . Bed-linens . Brand new building . Elevators. Comunal Swimming pool for summer season . Laundry . Downtown, 3 blocks from metro station, bus stop, commercial area, residential area, bars, pubs, restaurants, coffe-shop, banks, exchange house. Buenos Aires botanic park and Palermo forest. Included: All utilities are paid by the owner less cleaning service.